Join us for a day devoted to you! 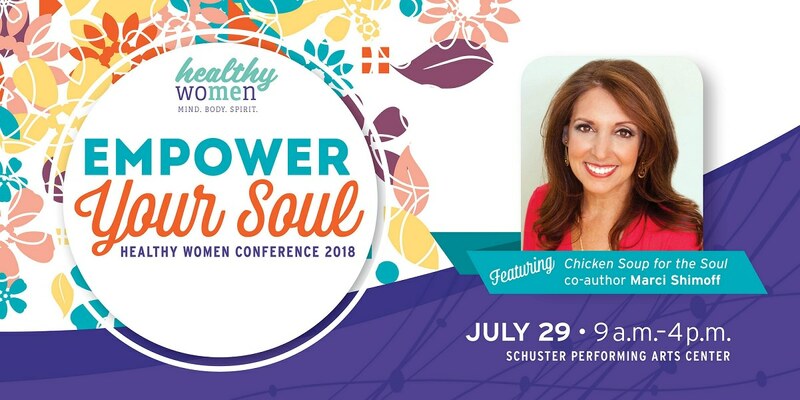 We’ll focus on how a balance of mind, body, and spirit factor into your whole health and enjoy a keynote delivered by Chicken Soup for the Soul co-author, Marci Shimoff. Beginner level yoga and beginner-level boot camp led by Logik Fitness. If you're not a Healthy Women member, join today and register for "Empower Your Soul" for just $15. Learn more about the break sessions with the guide below. Migraine headaches can range from painful and annoying to severe and debilitating. Join Dr. Mackenzie as she discusses what can trigger migraines and ways to manage the pain. 1 in 8 women will develop invasive breast cancer over the course of her lifetime. Early detection is key to better outcomes. Learn about the different types of breast screens and how you can be proactive in your breast health. From giving birth to getting older, women are twice as likely as men to experience urine leakage and bladder control challenges. Find out why this occurs and ways you can correct this issue. Good Neighbor House is a non-profit organization that has been providing medical, vision, and dental services, as well as food, education, and other support resources to the underserved in the Greater Dayton Area. Find out how you can get involved and be a neighbor to those in need. Yoga is a mind and body workout that involves strengthening and stretching exercises with breathing techniques and mediation. Modifications in movements and poses make yoga possible for people of all ages and ability levels. Your risk of developing cancer can be determined earlier than ever. Learn how family history and genetic screening allows providers to screen for cancer-causing genes and prescribe prevention plans that enable the earliest form of detection and best treatment outcomes. Childhood obesity can place children at risk for a lifetime of long-term health problems. Join pediatric nurse practitioner Joia Henson as she shares how to combat childhood obesity and provide a healthier future for your children. Dayton is home to the second largest food desert in the United States. Gem City Market is a community co-op initiative to bring a full-service grocery store and deli to West Dayton. Find out how you can become a member of the co-op and increase access to nutritious foods to those who need it most. Females have a greater incidence of stress fractures than males, and you don’t have to be an athlete to get one. Breastfeeding, menopause, and other factors can impact bone health and make you susceptible to a stress fracture. Learn how you can improve your bone health and prevent a stress fracture. Many women view menopause as an uncomfortable transition and closing of a chapter, however, there are strategies and therapies you can implement to continue to live life to the fullest. Join Dr. McCullough to learn how you can enjoy this next stage of life. OB/GYN Dena Costa, MD and certified nurse midwife Rhonda Conley, APRN-CNM, discuss types of maternity providers and how expectant parents can partner with them to have an empowered birth experience. Beginning in July 2018 all food labels in the United States will require showing “Added Sugars”. Learn how to read food labels and discover what you’re really eating. Get up and moving with LOGIK during a beginner friendly bootcamp session. Discover how children’s developing minds influence their behavior and learn strategies to break-through communication barriers. Youth Mentoring - A Cost-Effective Intervention Leads to Optimal Health for Every Child: Anne Pfeiffer, CEO and Emily Riggs, Match Support Specialist at Big Brothers Big Sisters of the Greater Miami Valley. 40% of a child’s health is determined by behavior. Adverse Childhood Experiences (ACEs) negatively impact growing brains and bodies and have the potential to disrupt all areas of a child’s life well into adulthood. Learn how having at least one safe and supportive relationship with a caring adult supports healthy brain development, contributes to children’s social-emotional and physical well-being, manages stress and strengthens their natural resilience. The Miami Valley has the highest number of opioid overdoses than any other area in the country. Paramedic and first responder Jennifer Mason shares how this problem is impacting our region, and what can we done to address it. Pain or fatigue in your legs or arms can indicate a larger problem with your heart and circulation. Peripheral vascular disease (PVD) is a circulation disorder, affecting approximately 20% of people over the age of 60, that causes blood vessels to narrow, spasm, or block. Join Dr. Gilkeson to learn more about PVD.